Do you ever wonder who created and designed that cell phones we use every day or how they make all of the fun updates and filters on social media? How about who is creating the self-driving cars of the future? What about who develops more environmentally friendly ways to design communities or creates new medical devices used by surgeons? Engineers and scientists created all of them! There are many exciting opportunities for women in engineering. 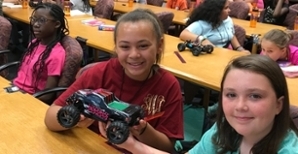 Come join the Women in Science and Engineering Program through Clemson University’s College of Engineering, Computing, and Applied Sciences and learn about these exciting opportunities this summer! Sponsored by Duke Energy since 1997, Project WISE gives participants a chance to experience Clemson University and the many wonders of the engineering field. What classes do campers take? Current Clemson professors lead project WISE classes. Participants experience fun and hands-on learning in engineering fields such as bioengineering, chemical engineering, electrical engineering, mechanical engineering, and mathematics. Students learn how science and engineering personally affect their lives and discover how exciting and rewarding careers in these fields can be. What do campers do for fun? Project WISE is not all work! Our counselors and staff ensure that campers have a great time participating in fun activities as well. Past groups have participated in movie nights, bowling nights, arts and crafts sessions, outdoor games, Zumba lessons and much more. Through both the mini-courses and extracurricular activities, we promote a strong sense of self-esteem in our campers to help them grow personally and as part of a team. Campers will stay busy and involved learning about engineering fields and building long-lasting friendships. Where do campers stay at Clemson? Campers stay for a week in an on-campus residence hall and eat in University dining halls. 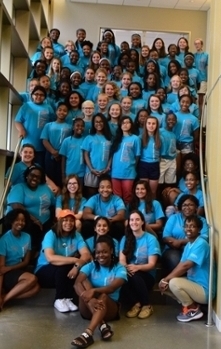 Counselors stay in the residence hall with campers to oversee activities and serve as role models during the program. The halls also offer a high level of security for the campers. Outside doors stay locked, and a security guard is on duty at night from 7 p.m. to 7 a.m. Campers have a lights out curfew of 10:30pm each night. Campers receive a meal plan, which provides them with three meals a day in the campus dining hall. The cost for the camp is $875. Need-based scholarships are available. Please fill out the Need Based Scholarship Application section of the online application if you are in need of financial assistance. Payment is made upon acceptance to the program. Fill out and submit the online application. Follow directions on the application page to turn in all supplemental documents needed for a complete application by the May 10th deadline. Incomplete or late application packets will not be considered.